The most intriguing enemy faced by the Federation is the Romulan Empire, and the Romulans definitely regard the Federation as their greatest foe! There is much more to them. 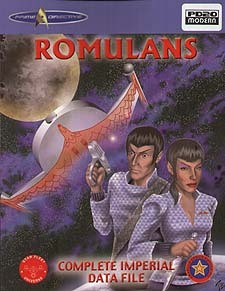 History of the Romulans: How they left Vulcan, found new worlds, and joined them together into a mighty empire. How Austus Tal became the first Emperor. The Romulan-Gorn Wars. complete Racial Profile: Everything there is to know about the Romulans! Biology, culture, military, government, emperors, religions, economics, legal system, the Great Houses, the State Security Agency, and more! Planet Survey: Complete data on the twin capitals, other star systems, 16 planets, the pirate stronghold of Revlis, the worlds of the Neutral Zone, and basic data on even more planets! Starships: A survey of the three different series of Romulan ships. The ancient Eagles (including the Vulture, Warhawk, Snipe, and Falcon). The converted Kestrels (KRs, K7Rs, K5Rs, and others build from Klingon designs). The new Hawks (SparrowHawk, FireHawk, NovaHawk, and more). Adventure! Deliver your cargo to Abraxas station and watch the Great Houses bid against each other. Slip across the border to a pirate base. How many Vulcans you've met are actually Romulans?